The Silver Lake area is one of the most unique areas in all of West Michigan and along the entire Lake Michigan shoreline. Silver Lake is located in Oceana County near the small community of Mears, Michigan. This small community welcomes tens of thousands of tourists every single year to enjoy the lakes, the activities, and the unique attractions local only to the Silver Lake area. The Silver Lake area has many cottages and homes that have beautiful views of the Silver Lake State Park that you just won’t be able to get anywhere else. Silver Lake is a great lake for boating, so if you are a water skier, a jet skier, or a casual pontoon boater, this is the ideal lake for you. What makes the Silver Lake area so incredibly unique is the Silver Lake State Park. This state park is a 2,000+ acres of sand dunes that are completely open to the public. Visitors come from across the state, the country, and the globe to see these dunes and to walk across them. 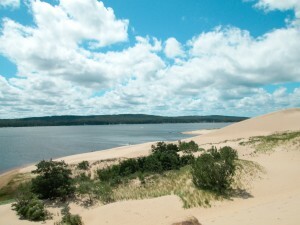 Additionally, the Silver Lake Sand Dunes are the only dunes east of Utah that private off-road vehicles can drive on. The northern area of the state park is for all-terrain vehicles and is a wildly popular tourist attraction. 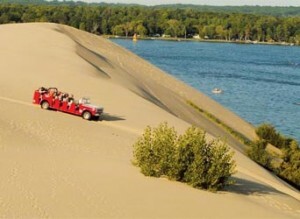 There is also a section of the park leased to Mac Woods Dune Rides that offers dune cruising for larger parties. There are many campgrounds and RV parks in the Silver Lake area for campers to come and take advantage of the beautiful surroundings. The state park campground features over 200 modern campsites where people can bring their cars and set up campers. There are also fully modernized RV parks where you can bring small, medium, and large RVs. These sites include water and electric hookup, paved RV parking, and amenities like pools and clubhouses. As a part of Michigan’s vast network of lighthouses, the Silver Lake area features its own lighthouse that is open for tours by the public. Little Point Sable is a Michigan lighthouse on the National Register of Historic Places. Its 107-foot tower can be climbed for any interested tourist for a small fee. 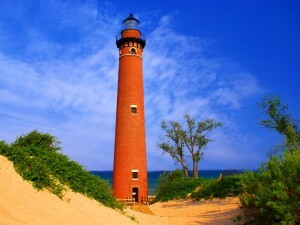 The lighthouse is not on Silver Lake itself; it is on Lake Michigan nearby Silver Lake. It is, however, a part of the Silver Lake State Park. The area around the lighthouse is a very popular beach and has excellent waters for swimming. If you are looking for a piece of property in the Silver Lake region, be sure to check out our full listings page. Also, if you have any questions about the properties that you see, be sure to fill out our contact page or give us a call. We would be happy to set up a showing for you.